Stainless steel, acier inoxydable in French, initially called "rustless steel" in English, was invented accidentally by Harry Brearley in 1913 when he was trying to find an improved alloy steel for use in rifle barrels. The first stainless steels created by Brearley were the very hard Martensitic form and it took some time before heat treatment techniques were developed that made it possible to forge it into domestic knife blades, the first commercial products. Brearley was succeeded by Dr. W. H. Hatfield who developed an Austenitic "18:8" stainless steel that was easier to work. From 1924 this new alloy was marketed by the Sheffield, England, steel masters Thomas Firth & Sons under the name "Staybrite". Stainless steel was not used for watch cases until the 1930s. Initially this was because it was too hard to be formed into watch cases by traditional means. Watch cases continued to be made of gold and silver, or nickel or ordinary carbon steel if a low price was needed. In the 1930s the rise in popularity of stainless steel as a fashionable material coincided with the worldwide financial slump that followed the 1929 Wall Street crash, which reduced demand for gold and silver watches. These two factors lead to moves to use stainless steel for watch cases instead of gold and silver. Techniques for forming watch cases from stainless steel were pioneered in Geneva by Taubert & Fils, successors to the Borgel company, using a special grade of Deep-Drawing Quality (DDQ) Staybrite steel that could be formed into the shape of a watch case without cracking. Staybrite stamp in Rolex case back. Click image to enlarge. 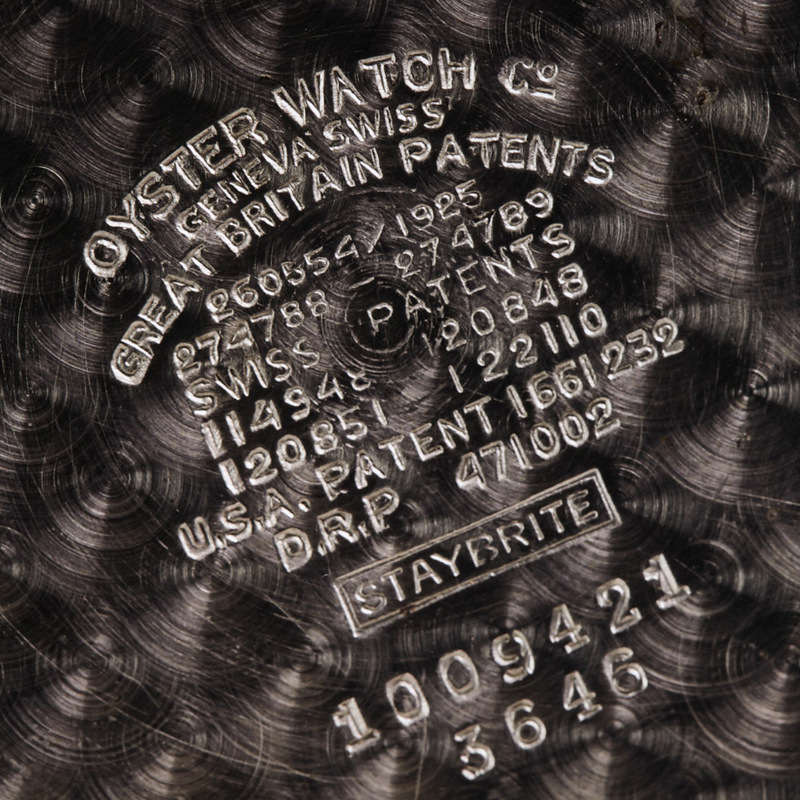 Image courtesy of and © Jose P.
The image here is an early Rolex 3646 (Panerai) case back with Staybrite stamp. Staybrite steel was made by Thomas Firth John Brown Ltd. of Sheffield and was protected by Swiss patent No. 138 647. Use of the name Staybrite like this required permission from Firth, and it could only be put onto items that were actually made of Staybrite steel. Brearley was head of the joint Brown Firth Research Laboratories in Sheffield, set up by John Brown and Company and Thomas Firth & Sons. In 1912 Brearley had been asked to look into the failure due to internal erosion of rifle barrels manufactured by the Royal Small Arms factory in Enfield, near London. Brearley thought that steel with an increased proportion of chromium above the five percent then in use might solve the problem and ordered in October 1912 two crucible melts of steels having 10 percent to 15 percent chromium. Both melts proved too high in carbon, but Brearley persisted with more melts, and a successful cast, No. 1008, with 0.24 percent carbon and 12.86 percent chromium was made on August 20, 1913. Samples were sent to Enfield for testing as rifle barrels but didn't show the desired improvement. However, while testing the material in the laboratory, Brearley noticed that it resisted acid etching for microscopic examination of its crystal structure, and he was surprised to notice that samples left in the laboratory atmosphere didn't rust. Brearley realized that this new material was ideal for cutlery, particularly knives, which at the time had carbon steel blades that rusted very easily, and he persuaded a friend, Ernest Stuart of R. F. Mosley & Co., to try it out. Stuart reported that knife blades made from the material had proved to be rustless (Stuart commented that stainless steel would be a more marketable name than rustless steel), but that the steel was so hard to forge it ruined his tools! Brearley's low-carbon alloy of iron and chromium was Martensitic stainless steel, meaning it had a very hard form of steel crystalline structure in the hardened condition, but was amenable to annealing by heat treatment to make it workable. Eventually, with Brearley's advice on forging techniques and heat treatment, satisfactory methods of working the material were developed. Martensitic stainless steels are ferromagnetic and not as resistant to corrosion as later austenitic stainless steels, so they are not often used now unless very hard wearing is required. Firths didn't make the most of Brearley's discovery and it wasn't patented in the UK, so many firms started making their own versions of stainless steel. Brearley was succeeded at Firths by Dr. W. H. Hatfield who developed an Austenitic stainless steel by adding nickel as well as chromium to steel, arriving at a stainless steel containing 18% chromium and 8% nickel (often called "18-8 stainless steel"). Austenitic stainless steels are very tough and ductile, non-magnetic, and cannot be hardened by heat treatment, but they can be hardened by cold working. From 1924 this new alloy was marketed by Thomas Firth & Sons under the name "Staybrite" and went on to be widely used in making cutlery, kitchen equipment and kitchen utensils. John Brown and Company and Thomas Firth & Sons merged in 1930 becoming Firth Brown Steels. In the early 1930s, Geneva jewellery, watch bracelet and watch case manufacturers were searching for a cheaper material to use instead of the precious metals they were used to because the Great Depression, the worldwide 10 year financial slump which followed the 1929 Wall Street crash, reduced demand for expensive items, so they needed to cut costs and reduce prices. Cedric Jagger noted that "the biggest melting-down of precious metal watch cases of all time took place in the great ... Depression of the 1930s". This melting down of watch cases for their precious metal naturally also meant that the demand for new watches in precious metal cases was reduced. Gold and silver cases were used for 51.8% of Swiss watches exported in 1920, falling to 29.1% in 1930 and only 5% in 1935. It is also notable that watches shrank to their smallest sizes in the 1930s, from a relatively common size for a man's watch of around 33 to 35mm diameter during WW1 down to as small as 28mm in the 1930s. Part of the reason for this seems to have been that watchmakers competed to make smaller and smaller watches to show off their technical prowess, but as ladies wristwatches had been available in this size for many years there must have been another cause which started this trend. A natural desire not to flaunt ones wealth during a period of such austerity, and therefore for a small and discrete wristwatch, was probably the origin of this fashion. Stainless steel was an obvious material to use, but because it was much harder than the silver and gold they were used to, they found it was difficult or impossible to shape, machine and polish with their hand tools and traditional, time honoured, techniques, and required changes in the way the watch cases were made. Silver and gold watch cases were traditionally made by forming, with simple hand tools, bar and sheet material into individual parts of the case, which were then soldered together and polished so that the joints between the component parts were invisible. This method of making watch cases developed before powered machinery was invented, but it was continued; partly out of tradition, but also because it was an economical way of handling the costly raw materials used; silver, gold and platinum. Even when powered machinery became available and it would have been possible to machine a watch case from the solid, the sheer availability and cost of blocks of silver and gold, together with the requirement to gather and reprocess large amounts of precious swarf, made this method of production economically impossible and so the old methods continued. But the advent of stainless steel changed everything: it was not practicable to make steel cases in the traditional way, the material was much harder than gold or silver, too hard to form by hand into the individual pieces required by the old methods. And making the many welded or soldered joints required by the traditional methods was difficult in steel. Neither was it necessary economically. As a raw material, steel was cheap; so cheap that its cost could, to all intents and purposes, be ignored in watch case making. It was economic to machine away large amounts of material during the manufacturing process. But this couldn't be done on an old hand turned bow-lathe, it required powerful machines. In an article in the Journal de Genève on 4 April 1934, Philip Werner, professor at the School of Watchmaking in Geneva, reported progress that had been been made in working with the new material. After explaining the difficulties of machining and forming stainless steel, which "at the beginning made them despair", and the processes developed to overcome these difficulties, M. Werner presented the audience with various objects from the watch case factory of Taubert & Fils, successors to the Borgel company, the watch bracelet makers Gay Frères, and the jewellery factory of A. and E. Wenger. Taubert & Fils had been working with stainless steel from the late 1920s. Because of their advanced watch case manufacturing machinery they were selected to demonstrate the techniques and processes necessary for making watch cases out of stainless steel to the rest of the watch case industry in Geneva. The Tauberts had invested heavily in modern machinery for their factory on the Rue des Pêcheries to be able to make watch cases, giving them a technical lead over many other Geneva watch case makers who still used traditional hand craft methods. A Taubert advert in 1943 noted that the serial production of stainless steel watch cases was made possible by the move of the old Borgel factory to the current "spacious, light and powerfully equipped" (emphasis added) factory in Plainpalais. Staybrite steel had been introduced to the Swiss watch industry in the 1920s by Firth Steel Sales AG, founded in 1919 in Switzerland as a subsidiary of Firth Brown, but until the 1929 crash had received little interest from Swiss watchmakers. A combination of financial pressures due to the crash and advertising by the makers of stainless steel promoting it as a new "wonder material" suitable for the "modern age" resulted in an interest to use it for watch cases. Notices by Firths in the Swiss watchmaking press, such as the one here from 1934, reminded watch makers, and watch case makers in particular, that Staybrite was only made by Thomas Firth John Brown Ltd. of Sheffield and was protected by Swiss patent No. 138 647. The notice also says that name "Staybrite" could only be used on items and watch cases actually made from Staybrite steel, and then only with authorisation from Firths. In his presentation M. Werner mentioned that the steel was an alloy containing 12% nickel and 12% chromium and "whose colour is particularly beautiful." Staybrite steel with 12% chrome and 12% nickel was called Deep-Drawing Quality (DDQ) because it had better cold workability than 18/8 stainless steel. In engineering terms, "drawing" is a forming process in which the metal is drawn over a former, or pressed into a die (mould) by a punch. "Deep drawing" refers to a drawing process where the depth of the drawn component exceeds the thickness of the material. The original 18/8 stainless steel was not sufficiently ductile to allow deep drawing, so the DDQ alloy with less chromium and more nickel was developed. This YouTube video Rolex 904L Steel shows watch cases being made by punching and drawing - the link will open in a new tab. Staybrite DDQ was less corrosion resistant compared to 18/8 stainless steel due to the lower chromium content, but 18/8 stainless steel couldn't be formed into watch cases by drawing so Staybrite DDQ was widely used for Swiss watches until the 1960s and 1970s when new stainless steel alloys, still closely based on the original composition of Staybrite DDQ, were developed. Today the brand name Staybrite belongs to F.W.Hempel &Co. and is registered and protected in numerous countries. Two important Geneva watch makers who placed early orders for stainless steel watch cases with the Tauberts because of their expertise in working with the new hard material, which their existing case makers couldn't work with, and who were consequently also early adopters of the Taubert waterproof Decagonal case with cork stem seal, were Patek Philippe and Vacheron Constantin.